Toshiba is one of the most trusted names in storage. Not only does it offer class-leading products, but it is constantly pushing boundaries. A few days ago, the company unveiled a 10TB NAS hard drive that focuses heavily on reliability. A few months ago, it announced a single-disk 1TB 2.5-inch HDD at a very slim 7mm. Today, Toshiba does it again. The company shows off a beautiful new 3.5-inch hard disk drive (model MG07ACA) with a monstrous 14TB capacity. While not the first drive to offer that capacity, it is the first 14TB drive that uses conventional magnetic recording (CMR) as opposed to shingled magnetic recording (SMR). This technological breakthrough is an important accomplishment, and Toshiba deserves major kudos. "The MG07ACA Series features both 14TB 9-disk and 12TB 8-disk models. The helium-sealed 3.5-inch mechanical design realizes better storage density and a lower HDD operating power profile than the previous MG06ACA Series for optimal TCO in cloud-scale infrastructures. The series also utilizes Toshiba Group's laser welding technology to ensure the helium remains securely sealed inside the drive enclosure. 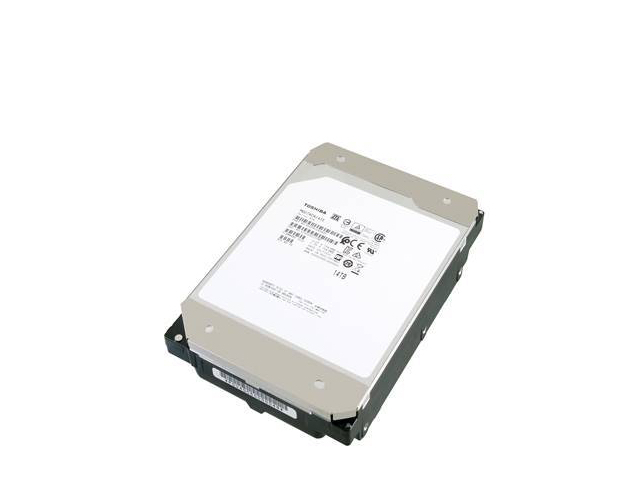 The drives support a SATA 6Gbit/s interface and 7,200rpm access performance. The 9-disk 14TB models achieve a 40 percent increase in maximum capacity over previous MG06ACA 10TB models. Additionally, the 14TB models improve power efficiency by over 50 percent (W/GB)," says Toshiba. John Rydning, Research Vice President for hard disk drives at IDC explains, "While enterprise server and storage customers realize that shingled magnetic recording (SMR) technology can improve HDD capacity, the adoption of SMR HDD products into server and storage systems is a transition that will take several years. Toshiba's new helium-sealed enterprise HDD is the world's first 14TB of storage capacity using conventional rather than shingled magnetic recording technology, giving enterprise customers the highest capacity HDD available in the market today for existing server and storage system architectures." When you can buy the MG07ACA is unknown at this time, although Toshiba is currently providing samples to some lucky organizations. While the drive will probably find its way into the computers of enthusiasts and other home users, it is mostly being targeted at the enterprise. After all, 14TB is some significant storage capacity -- much more than the average consumer needs for photos, games, and music.